There are fears other areas are being drawn into a unionist paramilitary feud between rival gangs of the UDA in County Antrim. 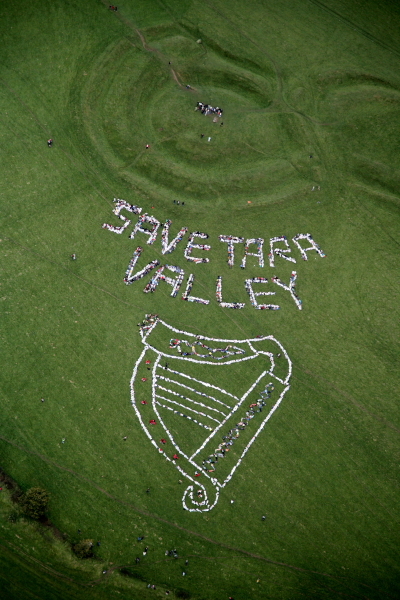 Hundreds of campaigners created a giant human harp in County Meath to mark Tara Heritage Day on Sunday. The protest is the latest in a string of high profile moves to pressurise the government into rerouting the M3 motorway away from the historic site. The sites under threat are inextricably linked with the harping and bardic traditions for more than 2,500 years. Protests were also held in New York, Chicago, Los Angeles and Dublin. The 26-County Taoiseach, Bertie Ahern, last night won a vote of confidence in the Dublin parliament, despite a challenge by the main opposition parties over the veracity of his evidence before the Mahon corruption tribunal. Britain is preparing natural resource claims on tens of thousands of square miles of the Atlantic Ocean floor, stretching from Rockall Island off the Irish coast down to Las Malvinas and Ascension in the south Atlantic. Sinn Féin representatives have refused to endorse the Policing Board’s latest human rights report. The governments on both side of the border need to show leadership in tackling suicide and self-harm, Gerry Adams has said. A large crowd assembled at Timoleague Cemetery last Sunday to remember IRA Volunteer Diarmuid O’ Neill whose 11th anniversary was that day. The PSNI have been using CS gas nearly every day on average since a hand-held spray form was introduced three years ago, it has been revealed. In a significant policy shift, Fianna Fail is to become an all-Ireland political party with a view to gaining power in the North -- but will not contest elections to the Westminster parliament in London. Death threats against prominent human rights lawyer Rosemary Nelson were broadly ignored by the RUC police prior to her assassination, according to a new report. A brick and a package containing three bullets were thrown through Sinn Féin offices in County Fermanagh last week. The same offices were badly damaged in a suspected arson last month. Up to one hundred protesters breached the perimeter of the Shell site in Erris, County Mayo as part of a planned ‘day of action’ last weekend against plans for a high-pressure gas pipeline and refinery. An appeal court has acquitted an Irish language teacher who had been arrested for talking to the PSNI police in Irish. An attempt to secure tax-varying powers for the Belfast Assembly was defeated on Monday. Unionists blocked the Sinn Féin motion after DUP Finance Minister Peter Robinson expressed reservations. DUP leader Ian Paisley will step down in January as Free Presbyterian Moderator to avoid a split in the church with those who disagreed with his political position. Ten families in County Antrim have been warned their homes may be targeted in UDA gun attacks within the next week. New hearings are to be held into six deaths at the centre of a Crown force shoot-to-kill policy in the North 25 years ago. A soldier who was jailed for life following the shooting dead of two teenagers in the North of Ireland is to serve in Afghanistan, according to a report today. More than 1,000 people attended the funeral in Maghera, County Derry, on Saturday of founder Provisional IRA member and former Sinn Féin Assemblyman, John Kelly. Provisional IRA founding member and former Sinn Fein assemblyman John Kelly has died. A retraction of the 35-year-old British Army claim that a teenager shot dead by a soldier in Derry was a “terrorist” has been welcomed by nationalists. It has emerged this week that senior unionist and nationalist politicians from the North have been working to build relationships between Iraq’s warring factions. The PSNI police have been accused of acting ‘in a brutal manner’ during an incident in a County Derry village in the early hours of Saturday morning. Sligo Sinn Féin councillor, Sean MacManus, has dismissed speculation that he is about to resign from the party after two others councillors in the South quit the party last week. A bomb attack on a Catholic church in County Down is the latest in a series of sectarian attacks across the North. Eamon Gilmore is certain to become the next Labour Party leader after a number of potential rivals confirmed that they would not be contesting the leadership election.